Single-family homes built-for-rent increased to approximately 8,000 starts for the second quarter of 2015, compared to about 6,000 for the same period of 2014. The share and count of built-for-rent starts are off post-recession highs and will likely approach historical norms as the housing market continues to expand. However, given the relatively small size of this market, care must be taken when tracing changes in the estimates. 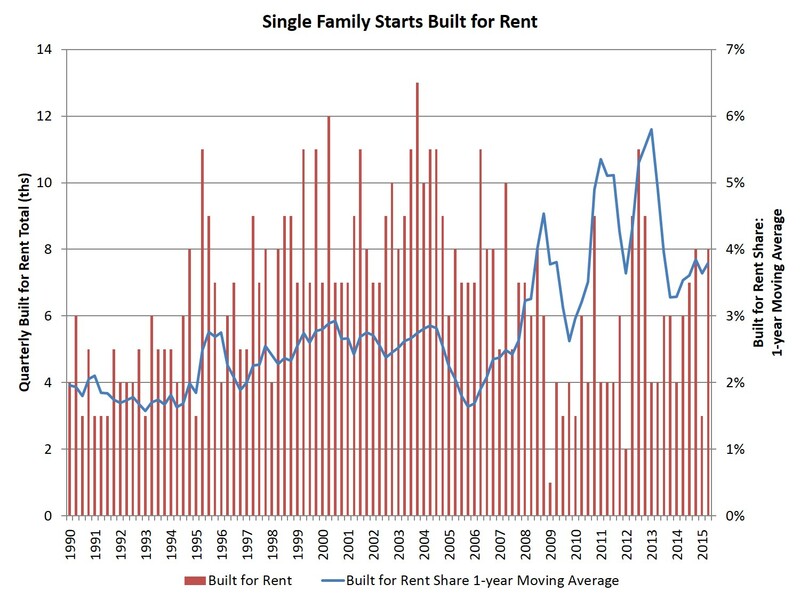 According to data from the Census Bureau’s Quarterly Starts and Completions by Purpose and Design and NAHB analysis, the market share of single-family homes built-for-rent, as measured on a one-year moving average, stands at 3.8% of total single-family starts for the second quarter of 2015. It is worth noting that the estimates for this market segment are small, so that quarter to quarter movements are typically not statistically significant. The current market share remains higher than the historical average of 2.8% but is down from the 5.8% registered at the start of 2013. This class of single-family construction excludes homes that are sold to another party for rental purposes. It only includes homes built and held for rental purposes. With the onset of the Great Recession, the share of built-for-rent homes rose. Despite the current elevated market concentration, the total number of single-family starts built-for-rent remains fairly low – only 26,000 homes started during the last four quarters. Of course, the built-for-rent share of single-family homes is considerably smaller than the single-family home portion of the rental housing stock, which is 29% according to the 2011 American Community Survey. The reason for this is that as single-family homes age, they often transition to the rental housing stock.